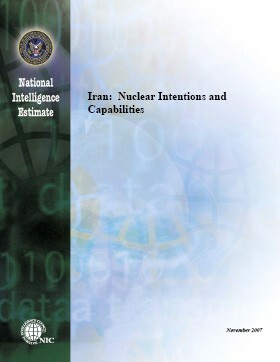 With the Dec. 3 publication of a completely unexpected declassified National Intelligence Estimate (NIE), "Iran: Nuclear Intentions and Capabilities," a consensus has emerged that war with Iran "now appears to be off the agenda." Indeed, Iran's president, Mahmoud Ahmadinejad, claimed the report dealt a "fatal blow" to the country's enemies, while his foreign ministry spokesman called it a "great victory." I disagree with that consensus, believing that military action against Iran is now more likely than before the NIE came out. Let us skip ahead then, and ask what are the long-term implications of the 2007 report? Convince the Iranians of their own accord to stop the nuclear weapons program. Stop it for them through military intervention (which need not be a direct strike against the nuclear infrastructure but could be more indirect, such as an embargo on refined petrochemicals entering the country). Permit it to culminate in Iran's acquiring a nuclear bomb. As for Option #3, President Bush recently noted that whoever is "interested in avoiding World War III, … ought to be interested in preventing [the Iranians] from having the knowledge necessary to make a nuclear weapon." So far, the lame NIE has not changed his mind. He appears to share John McCain's view that "There's only one thing worse than the United States exercising a military option. That is a nuclear-armed Iran." Therefore, the real question is not whether Iran will be stopped, but how. The 2007 NIE has effectively terminated Option #1, convincing the Iranians themselves to halt their nuclear program, because this route requires wide external agreement. When key countries banded together to pass Security Council Resolution 1737 in December 2006, it caused the Iranian leadership to respond with caution and fear; but the NIE's soothing conclusion undercuts such widespread cooperation and pressure. When Washington pressures some Western states, Russia, China, and the IAEA, they can pull it out of the drawer, wave it in the Americans' faces, and refuse to cooperate. Worse, the NIE has sent a signal to the apocalyptic-minded leadership in Tehran that the danger of external sanctions has ended, that it can go undisturbed about its bomb-building business. That leaves Option #2, direct intervention of some sort. Yes, that seems unlikely now, with the NIE dropping like a bombshell and shifting the debate. But will this hugely-criticized one thousand-word exercise really continue to dominate the American understanding of the problem? Will it change George W. Bush's mind? Will its influence extend to a year from now? Will it extend yet further, to the next president? Highly unlikely, for these projections assume stasis – that this one report can refute all other interpretations, that no further developments will take place in Iran, that the argument over Iranian nuclear intentions closed down in early December 2007, never to revive. The debate most assuredly will continue to evolve and the influence of this NIE will fade and become just one of many appraisals, technical and non-technical, official and unofficial, American and non-American. In short, with Option #1 undermined and Option #3 unacceptable, Option #2 – war carried out by either U.S. or Israeli forces – becomes the more probable. Thus have short-sighted, small-minded, blatantly partisan intelligence bureaucrats, trying to hide unpleasant realities, helped engineer their own nightmare.